“You can summit Mt Whitney in a day,” they said. “It’s a class 1 hike,” they said. Add to that the claim that it takes 10 hours to hike up at a “slow” pace, and you may start thinking the Mt Whitney hike is downright easy. But “easy” isn’t a word I would use to describe our hike to the tallest peak in the contiguous U.S. this July. I’m a little behind in posting our shots of the week, so this photo is coming at you a month late, but it represents a pretty exciting milestone for Ian as a photographer. It also proves why booking places through Airbnb is so awesome. So why is this week’s shot of the week a photo of a photo (actually three photos)? Well, we met some seriously cool people in Mexico City last month. One of them, our new friend Rodrigo (whom we met through Airbnb), organized the printing and display of three of Ian’s Milky Way photos in beautiful light boxes — designed and manufactured by Rodrigo himself — in a lovely little gallery called Dolcenero in Mexico City. It’s the first time Ian’s photography has been on public display! This photo is from the opening day of the exhibit. Note: The post date has been adjusted to appear in chronological order (by the date the photo was taken) on the blog, but I’m actually writing/posting this on May 10, 2015. This photo of Ian with his new camera is one of the first photos I took with my new camera (with some Photoshop involved). And the text is part of our new logo for The Photon Collective — designed by Ian. What do you think? This past weekend, Ian set out for the chilly darkness of Red Rock Canyon State Park. He captured the stars and the Geminids meteor shower above the rusty red rock formations before moonrise. This shot is a compilation of four separate meteor photos he caught with his camera. After a full evening of field work for our latest Lonely Speck production, the Milky Way floats above the yellow aspens and majestic evergreens of Thomas Creek in autumn in Reno, Nevada on October 22, 2014. The full image plus a video treat await those who continue to the full post. On the fourth day of our road trip through the Western U.S., we headed to Bryce Canyon. We arrived around noon and were happy to find that the ‘full’ signs had not yet been hung next to the campground names at the entrance. Between Zion and Bryce Canyon, we stopped in Red Canyon to set up camp on day 3 of Road Trip USA: Summer 2014. After having a hard time finding camping at Zion, we pulled into Red Canyon Campground around 3pm to avoid another after-dark search for camping. Red Canyon is located near Panguitch, Utah, in the Powell Ranger District of the expansive Dixie National Forest. 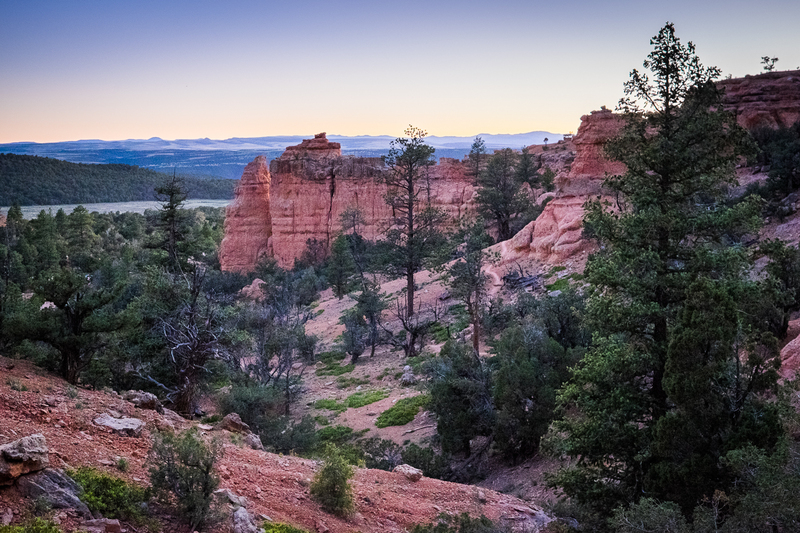 With a landscape resembling a hybrid between Zion and Bryce, Red Canyon is home to red sandstone spires as well as dense sections of pine trees.